The beaches of St. Johns County are the areas largest natural resource consisting of 41.1 miles of various sandy conditions. From coquina to white soft sand, our beaches host a variety of coastal species and provide endless recreational opportunities. Visitors enjoy recreational and commercial fishing, surfing, horseback riding, sunbathing, beach combing, and beach driving. On 16.3 miles of our beaches, driving is allowed at various levels of restrictions. 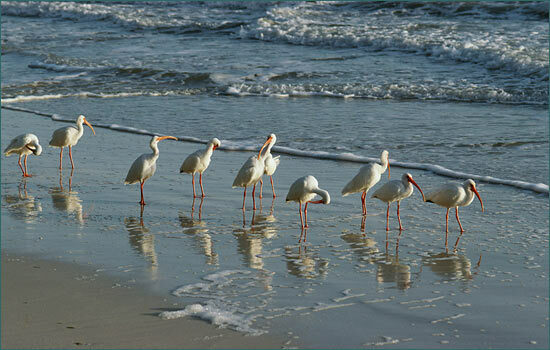 Beach driving is a lawful and traditional activity that can affect protected species such as sea turtles, the native Anastasia Island Beach Mice (AIBM), sensitive shorebirds, and their nesting and feeding habitats. St. Johns County recognized the need for coordinating lawful beach activities in a manner that maintains public use, while minimizing negative impacts to the natural beach/dune environment and the protected species that depend on its health. In August 2006, St. Johns County received approval from the United States Fish and Wildlife Service (USFWS) for a 20 year Incidental Take Permit (ITP) and Habitat Conservation Plan (HCP) to minimize these possible effects. Visit www.sjcfl.us/HCP to find out more about the varied activities of the Habitat Conservation Program including Beach Use Permit training, clean up events, and Sea Turtle and species protection programs.